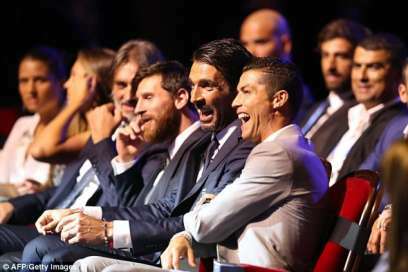 For the third time, Real Madrid star and former Manchester United player, Cristiano Ronaldo, has been named UEFA Men's Player of the Year ahead of Juventus goalkeeper and captain Gianluigi Buffon was second in the voting and, again, Messi. Ronaldo struck 25 goals in La Liga last term, and 12 in 13 matches during Real Madrid's Champions League-winning campaign. Previous winners of the award include Messi who has won it twice and Barca team-mate Andres Iniesta, who claimed the prize in the 2011-12 campaign ahead of the Argentina international in second. "There are the same goals every year, to meet the same challenges, win everything if possible, qualify for the World Cup with my national team,This trophy will give me the motivation to keep working hard, never to give up. I am blessed and delighted to be with Real Madrid." 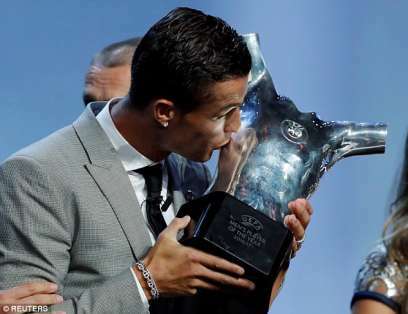 Ronaldo won the UEFA award in 2013-2014 and 2015-2016 and in the Champions League last season, where Real defeated Juventus 4-1 in the final, he finished as top scorer with 12 goals and now 2016-2017. Women’s Player of the Year went to Lieke Martens of Barcelona, who topped Pernille Harder of Wolfsburg and Dzsenifer Marozsán of Lyon.